Yesterday, in Dawson Creek, was our first day without rain in two weeks. This morning it was a beautiful short sleeve morning. About 8 AM it was like someone fired a starting gun as RVs all over the RV Park started up and head to Alaska. We left at a more sedate 9 AM. About an hour down the road the rain showers started and we would have rain or showers the rest of the day. At one point the outside temperature dropped to 31 F and we had snow falling. The 280 mile drive to Fort Nelson was uneventful with a lot of RV traffic heading north and rain or rain showers the whole way. 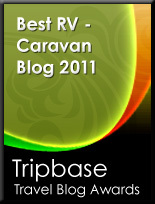 Our first choice for an overnight RV Park was booked full because they had two caravans coming in this evening. 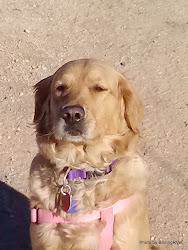 Fortunately, we arrived in town about 3 PM and were able to get sites at an RV Park at the other end of town. The most eye opening thing of the day was the price of diesel we paid $6.00 per gallon in Fort Nelson. Fred stopped along the way today and paid $6.23 per gallon for diesel. 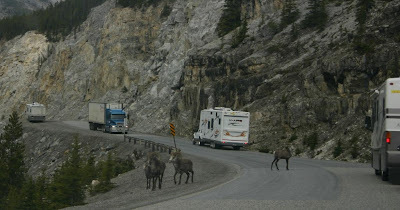 Even at these prices the road is full of Motorhomes headed north. After overnight rain we woke to mostly clear skies and a little wind. Today’s destination was Laird Hot Springs Provincial Park. This is a naturally occurring hot springs pretty much in the middle of nowhere. 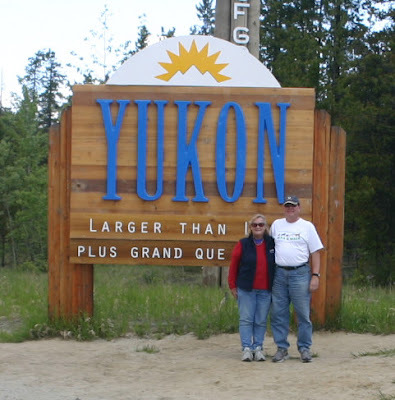 It is 188 miles from Fort Nelson and 138 miles to the next town which is Watson Lake. The scenery today was SPECTACULAR; miles and miles of mountains, trees, rivers and lakes. We saw Stone Sheep (a localized sub-species of Big Horn Sheep) on the road in a couple of locations; we had Wood Buffalo along the road and plenty of signs warming us that there were buffalo on the road. We also saw our first Caribou of the trip and both Mule Deer and more Rocky Mountain Big Horn Sheep. About noon we had a few rain showers but they didn’t last very long. 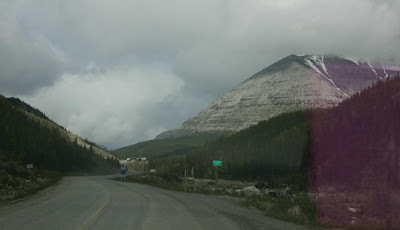 This is the Alaska Highway that I had read about. The road is very rough; the potholes are frequent and huge. Even where the potholes are patched it is rough. We did hit a few gravel patches, but they didn’t seem any worse than the paved road. After our experiences at Fort Nelson of not getting in to the RV Park due to the caravans and considering that Liard Hot Springs has only one private campground we made reservations. This area is so remote that the Provincial Park has no power and the private campground runs a generator 24 hours a day for their power. The campground is small and tightly packed as there is a caravan of Motorhomes here for the evening. Surprisingly, the price of diesel here is only a penny a liter more than Fort Nelson. You know something is wrong when you are relieved to be pay ONLY $6.00 per gallon! As I said there are very few choices on RV Parks or campgrounds; about 10 PM the water pressure went to zero. In the morning the water was back but at 7 AM all power in the campground went out and didn’t come back by the time we left. Birding Note: Today’s best bird was a Golden Eagle that dropped out of nowhere to grab its lunch right next to the road. I had read that there was good birding by the hot springs and I went over to see what I could find. The area is very thickly forested and I heard many birds but saw very few. I did add Mew Gull to the year list. Today was a short day only 130 miles to Watson Lake. The road today was better than yesterday in that there were fewer potholes but the road surface is still very rough. The roads up here are all “chip seal”. They put down asphalt and then pour oil on it followed by gravel. They then just let cars and trucks run over the gravel to imbed it into the oiled asphalt. Every few years they repeat the oil and gravel treatment. The scenery remains spectacular and today there has not been any rain. During our drive today we saw two black bears, six buffalo and one very large black wolf all along the road. Watson Lake is home to the Sign Post forest. Army engineers here to build the Alaska Highway put up a pole with arrows pointing toward their hometown and how far it was. The tradition has stayed on with passing motorist putting up homemade signs, leave their license plates and even stealing the signs from their hometown. There are thousands of signs. 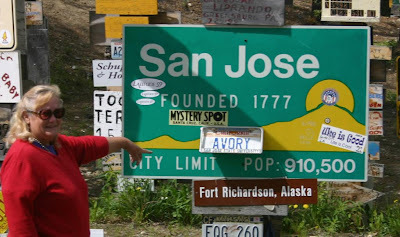 (they hit number 10,000 back in 1992) Including a San Jose, California sign!